Seeing as the MAC fluidline is my ultimate eyeliner of choice, it's very rare that I stray away from the product to check out other eyeliners. But when they're in different colours, that's a whole different story. 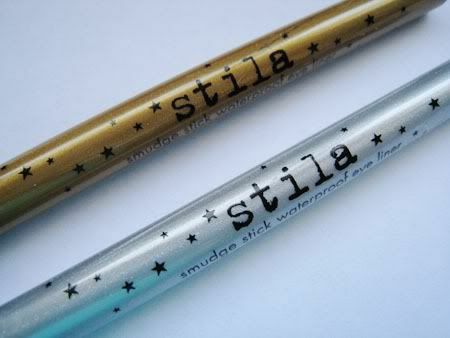 I picked up these two smudge sticks as part of an order from Sephora I had made earlier, because they were on sale. 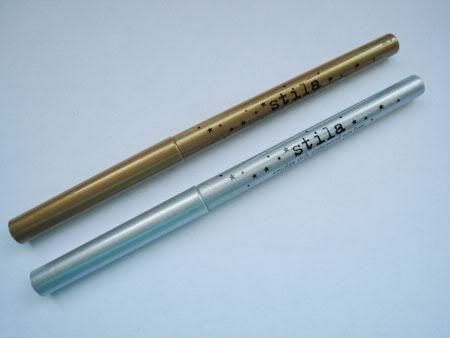 They're the first eyeliners from Stila that I have purchased, and I'm actually quite impressed with them. The two eyeliners themselves were smooth, and glided well on the eyelid without tugging at the skin. I honestly hate using pencil liners for this reason, they are always tugging at my skin and make me worry about wrinkles and floppy eyelids, hah. The colours are highly pigmented, and are budge and smudge proof, which was nice - don't want to have weird looking metallic panda eyes, my friends. The product glides on smooth as butter, and does give at least a good eight hours of wear. A little product goes a long way, so if you're looking for a nice, long lasting metallic liner, these might be right for you. Koi is a medium gold shade, the base colour is darker than what I consider to be gold, which is made up for with the high sheen finish. Silver Dollar on the other hand is a lighter, shimmery silver, also with a nice sheen finish. Both are great colours for highlighting in the inner corners, or worn on the bottom lash line. 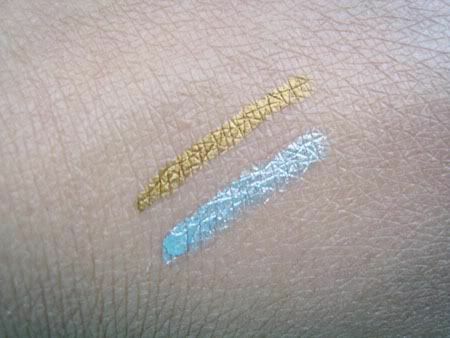 The smudge stick eyeliners usually retail for $20, giving 0.01 oz of product which is honestly pretty expensive when you consider the amount of product you are paying for. My regular MAC fluidline retails for $15, giving 0.1 oz of product. That's 10x the amount! So before purchasing, definitely evaluate whether the purchase of the product will be worthwhile. I really like the silver one. I usually use an eye shadow to put in the corner of my eyes but it's hard to apply. Will have to look into these pencils. Thanks for sharing.